Radiation in high doses kills cells or keeps them from growing and dividing. Because cancer cells grow and divide more rapidly than most of the normal cells around them, radiation therapy can successfully treat many kinds of cancer. Normal cells are also affected but, unlike cancer cells, most of them recover from the effects of radiation. To protect normal cells, radiation therapists carefully limit the doses of radiation and spread the treatment out over time. They also shield as much normal tissue as possible while focusing the radiation at the site of the cancer. External beam radiotherapy uses machines to focus radiation on a cancer site. Depending on the amount of energy it possesses, the radiation can be used to destroy cancer cells both on the surface and deeper in the body. The higher the energy of the beam, the deeper the radiation can penetrate into the target tissue. Internal radiotherapy, or brachytherapy, places radioactive implants directly in a tumour or body cavity. In this treatment, the radiation dose is concentrated in a small area, and the patient may need to stay in the hospital for a few days. What does a Radiation Therapist do? Therapists also play an important role in counseling patients on possible side effects from treatments and provide advice on how best to minimize these effects. Because radiation treatments often extend over several weeks, a special supportive relationship often develops between the therapist, the patient and the patient’s family. Why become a Radiation Therapist? Radiation Therapists use cutting-edge technology. Advanced computer systems allow the simulation and planning of treatment details, and ensure the accuracy and effectiveness of treatment delivery. Work closely with patients, doctors, and other health professionals as part of the interdisciplinary health care team. Radiation Therapists provide the patient and their family with in-depth and continuous care, support, and counseling throughout the treatment process. Radiation Therapists are detail-oriented and enjoy applying their knowledge of biology, mathematics and physics, since their work requires precision and the safe operation of sophisticated equipment. This course is an introductory course designed to serve as the foundation in Human Anatomy for students in the Medical Radiation Sciences program. The course will introduce learners to the components of the human body, relationships of the surface anatomy and the body's internal components and discuss the basic function of these components. The course will encompass a regional approach to study the human body with correlation to its clinical application. Course delivery will be comprised of both in-person lectures and in-person labs. This course is designed to introduce the learner to the complexities of diagnostic and therapeutic imaging in the healthcare setting. Learners will develop an understanding of what it means to be a medical radiation technologist, a healthcare professional, and how to collaborate interprofessionally. As well, learners will be exposed through a series of seminars delivered by healthcare professionals from the practice setting, to a variety of imaging modalities used in the diagnosis and treatment of patients. Modalities such as X-ray, Computed Tomography (CT), Magnetic Resonance Imaging (MRI), Ultrasound (US), Positron Emission Tomography (PET), and Image Guidance for Radiation Therapy will be explored. Additional topics relating to the imaging modalities will be covered including informatics. Learners are provided with the opportunity to learn about and practice the common technical and non-technical skills necessary for caring for patients in the clinical environment. The covered topics will provide fundamental knowledge and skills in patient care and professional development. This course provides the learner with an understanding of the basic concepts of oncology, including epidemiology and etiology, natural history, clinical signs and symptoms, routes of spread, pathology, staging systems and management approaches. Topics covered also include diagnostic and staging workup, prognostic factors, decision-making skills for treatment options, and principles of treatment. Aspects of the physics and chemistry of ionizing radiation will be discussed. The cellular and molecular effects of ionizing radiation and how they help in the understanding and current practice of radiation therapy will form the major emphasis of the course. Sources of data on the effects of human exposures to ionizing radiation will be described. 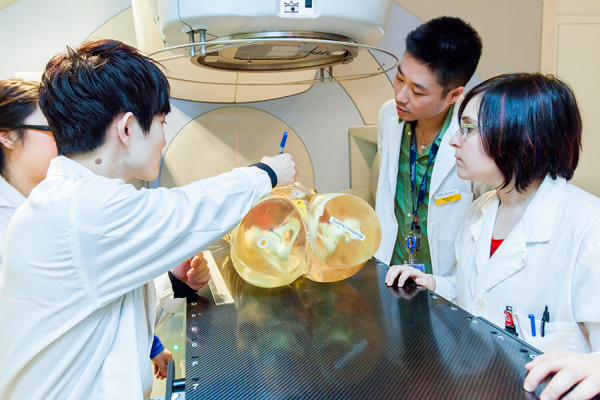 As well, there will be a description of a typical radiation protection program at a radiation therapy facility. This course examines the different types of radiation and how they interact with matter. Pertinent properties of both the radiation and the materials that dictate the nature of the interaction are discussed. A review of the structure of matter also reveals the physical origin of radiation production in relation to both external radiation therapy and brachytherapy. This Relational Anatomy course requires learners to apply their knowledge of gross anatomy to explore the cross-sectional and relational anatomy of the head, central nervous system, neck, spine, thorax, abdomen, pelvis (male/female) and the upper and lower extremities. An emphasis is placed on the learner’s ability to identify and justify the relative positions of the organs, the vascular system, the lymphatic system as well as muscular and skeletal structures in each of the aforementioned anatomic regions. This course examines the use of contrast media agents for the purpose of diagnostic and interventional medical imaging. Learners will examine the rationale for the use of different types of contrast media agents available, the complications and adverse reactions that can result from the use of contrast agents, and the legal implications of contrast media administration. Learners will also gain practical skills in performing intravenous injections using both angiocatheters and butterfly needles. This course will introduce students to the function of the organ systems that comprise the human body. The course will follow a systematic structure covering all of the principal functional systems within the body, examples include the cardiovascular and respiratory systems. Learners are expected to be familiar with the anatomical structure of these systems. This course prepares first year students with the knowledge and skills of basic patient care that will be utilized in the clinical setting. This is the first of two patient care courses specific to the practice of Radiation Therapy. This course will introduce new patient education, the general side effects experienced by the cancer patient, their management strategies and the support services available to the patient. Emphasis in the laboratory component is placed on communication skills, patient assessment, patient and family education and documentation as they relate to the care of the cancer patient. The first part of this course covers the methods of characterizing radiation beams in air and in a standard phantom. Relevant beam data, factors, and their dependence with beam energy, treatment distance and other parameters are described. Clinical applications of this data in manual patient dose calculations are illustrated using a number of basic external beam therapy techniques. Some of the above concepts will be demonstrated in a series of two labs. The labs have been designed to allow the students to determine relationships through experimentation, as well as compare and contrast beam data. The course will introduce the learner to the radiation therapy treatment delivery process. The learner will develop psychomotor and problem-solving skills that will be utilized for application of radiotherapy treatment on a linear accelerator with on-board kV imaging. The learner will have the opportunity to practice technical and patient communication, interpreting documentation, image acquisition and assessment, quality assurance procedures, setup, and safety. In this course the learner will develop an understanding of their future professional roles as a Radiation Therapist, the significance of collaborative patient-centred care (Interprofessionalism) and gain an appreciation of the cancer patient experience. While in the clinical setting, the learner will have an opportunity to practice introductory radiation therapy skills in their assigned clinical site. The specialized electives (“selectives”) are courses developed with the purpose of providing graduates of the Medical Radiation Sciences (MRS) Program with knowledge and expertise in specialized fields of practice. Selectives are designed to give students some freedom in constructing a curriculum that responds to their own particular interests related to their chosen profession and/or academic endeavors after graduating from the program. Examples of selective courses that are available to MRS students are: Physics of MRI, MRI Anatomy and Pathology, Informatics, Introduction to Brachytherapy, Patient Education, Supportive and Palliative Care, and many more.